Home How To... Forced Perspective? Um, I think it’s just perspective when you’re lying in the dirt photographing toys? The forced perspective technique sways our perception with the use of optical illusions to make objects appear larger, smaller, further away, or closer than they actually are. It manipulates perception through the use of scaled objects and the correlation between them and the vantage point of the camera. You know the ones; someone “holding up” the Leaning Tower of Pisa, an outstretched “giant” arm appearing to be holding a screaming “little” person, a “giant” shoe descending upon some cowering “little” people below. As I was reading through Shelly’s great “the basics” posts, I thought to myself, “Hey Shelly! You’ve missed one!” But maybe it wasn’t that this photography technique was overlooked? Maybe it was more that forced perspective is a given with toy photography? Sure, some do it better than others, some go above and beyond to create the illusion that a toy, be it LEGO, a toy car or a Millennium Falcon model is actually standing in that street, parked out the front of that garage or resting in that field, some are truly masters at creating the impression that their toys are really a part of the landscape through the forced perception technique. But don’t we all use some degree of forced perspective in our toy photography? If we break down the definition, it sounds like every decent toy photo to me? Forced perspective “sways our perception”, it “makes objects appear larger, smaller, further away, or closer than they actually are”, it uses “the scale of the objects” and it utilises the “vantage point of the camera” to “manipulate the perception” of the viewer. 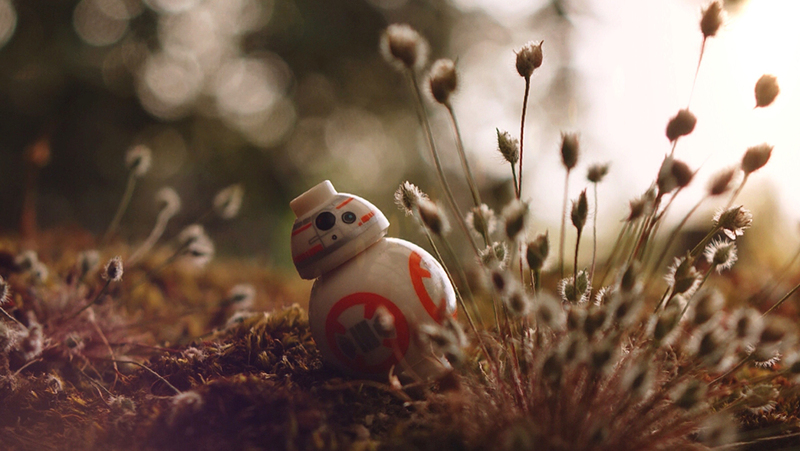 Replace “forced perspective” from the above sentence with “toy photography”. Go on! See? It kind of makes sense doesn’t it? I spent ages hunched over scouring our paddocks for the perfectly scaled object (grass) for this shot, and then I had to dig out a hollow to get the camera at the right vantage point. So, I’m sorry I thought you’d missed one of “the basics” Shelly. Maybe this photography technique shouldn’t be categorised as a technique when we photograph toys? Maybe forced perspective simply becomes perspective when the majority of our subjects are disproportionately scaled to their environments? Maybe “manipulating perception through the use of scaled objects and the correlation between them and the vantage point of the camera” is toy photography? Great post, Brett! I too have wondered what forced perspective REALLY means for toy photography, so it’s nice to know I’m not the only one! I think some of the best or most effective toy photos make you forget that you’re looking at a small 4 inch piece of plastic transplanted into a much bigger “real” environment. There are exceptions to this rule, of course, but manipulative perception is something inherent in toy photography, so I agree with your conclusions here.